David Letterman's last day on "The Late Show" is here. The iconic comedian will tape his farewell episode on Wednesday afternoon, and almost no one -- not even the CBS executives who are flocking to the Ed Sullivan Theater to watch -- knows what is planned. There was a partial rehearsal on Tuesday night. 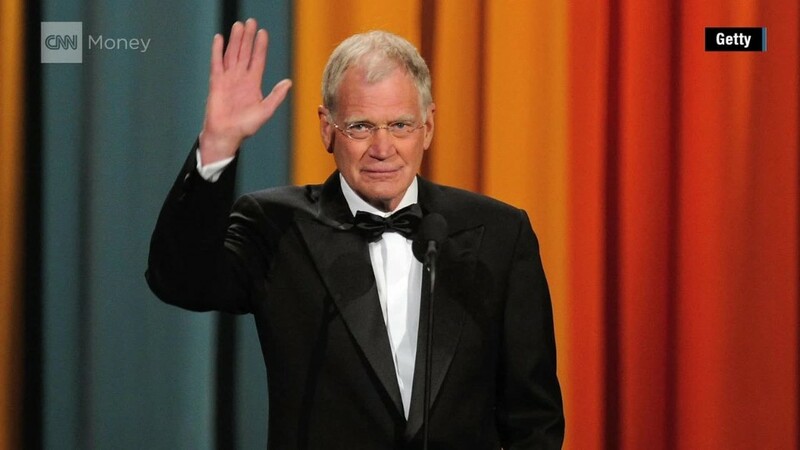 But Letterman has not rehearsed his closing monologue ahead of time, according to a representative of the show. Jerry Seinfeld, Chris Rock, Steve Martin, Tina Fey, Alec Baldwin, Jim Carrey, and Peyton Manning were among the stars seen walking into the stage door of the theater on Wednesday afternoon. Presumably they'll be appearing at some point on the finale. CBS Corporation CEO Les Moonves also walked in about an hour before the taping was scheduled to begin. For now, the only confirmed production detail is that the Foo Fighters, a quintessential "Late Show" band, will be performing. "Final time on this stage...#ThanksDave," the band tweeted on Wednesday. 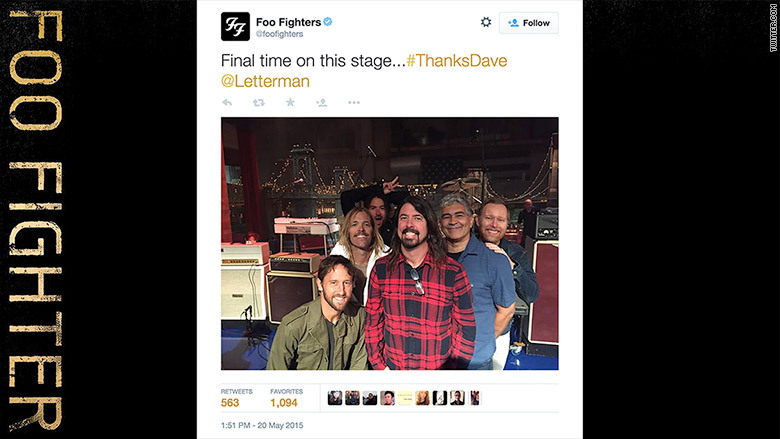 Foo Fighters tweet their last time on Letterman's set. The Foo Fighters news was first reported by Rolling Stone. "The Fighters of Foo," as Letterman has called them over the years, have appeared many times on Letterman's broadcast. To have the rock band on the final show is bound to be a touching moment for viewers and the host. 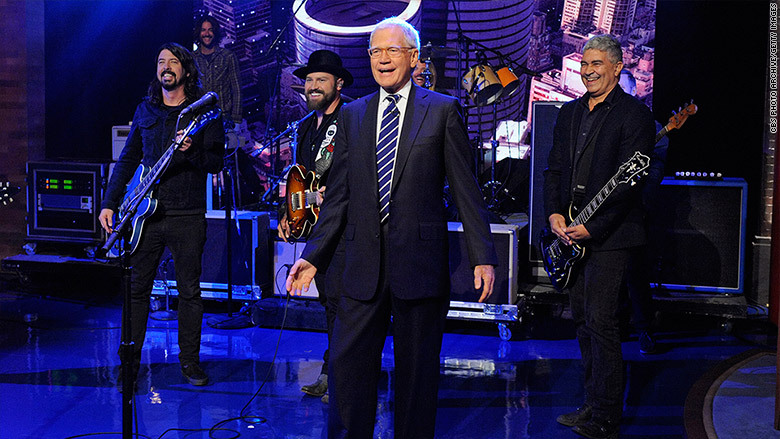 David Letterman with Foo Fighters. There could be cameos from other late-night hosts during the finale -- but not Jay Leno. He declined the show's invitation to appear. Longtime "Late Show" executive producer Rob Burnett said of the last episode, "We have all kinds of stuff planned." In lieu of the usual sit-down interviews, there will be highlight clips from past episodes and a "beautiful ending to the show that Barbara Gaines, one of our executive producers, really marshaled," Burnett said. "I think it probably will come down to the minute that Dave says goodnight," he added. "Dave is very good at that, and I think no matter what he does, it will have emotional impact." After Wednesday afternoon's taping, the staff will gather for a party. And then what? Well, Letterman hasn't said much about what's in store for him. He and his producers have to move out of their office space in the coming days -- the staff of Stephen Colbert's "Late Show" is about to move in. "Well, here we are at the last show," veteran Letterman producer Barbara Gaines tweeted on Wednesday morning. "Everything I own I owe to Dave Letterman. Thank you for 35 years." Gaines' Twitter bio says, "I work in television but only for one more month." As for the Foo Fighters, when the band played on the show last year, Letterman told an emotional story about how the band's song "Miracle" had been added to a video of him and his son, Harry, skiing together. "This is the second song of theirs that will always have great, great meaning for me for the rest of my life," Letterman said at the time. Foo Fighters were also there for another emotional moment in Letterman's career and life -- the night the host returned from heart surgery. In that performance, the band played "Everlong" which Letterman said was his "favorite song." The band also did a week-long stint on the "Late Show" last year and finished out the week by being a part of a Top Ten list titled "Top Ten Things Foo Fighters Would Like To Say After Spending a Week at the Late Show." "We agreed to do this because we thought Dave was dying," said drummer Taylor Hawkins during the list. Foo Fighters join other huge musical headliners from the week, like Pearl Jam front man Eddie Vedder, who performed on Monday, and music legend Bob Dylan, who performed on Tuesday night.